My treasure hunters trying out their new cargo-pants-turned-field-bags. What better way to recover from a weekend than a creativity binge? Instead of cleaning my studio and re-shelving all my props from the Powwow this weekend, I’ve been sewing up a storm. At last count I had 2 field bags, 6 bibs and a bunch of cloth napkins. The Powwow was a good time, despite the weather. Saturday the sun showed up, and therefore, so did the crowds. I demonstrated porcupine quill, wrapping a rawhide medicine wheel with dyed quills. Sunday saw a stead rain ALL day. Honestly, in the 5 years I’ve done this festival (3 times a year, at that) this is the first time it rained for an entire day. Rather than be miffed by the fact that rain keeps the crowds away, I took it as a vacation day. It’s all in the attitude, right? I sat under a dry tent, worked on an easy quillwork project and listened to the rain. No kids to entertain, no laundry or cleaning to distract me. Just drinking coffee, listening to the drums and the music of the weather, enjoying my craft. During the especially slow afternoon, my neighbor the flintknapper and I traded secrets; I showed him some quillwork, he let me bang rocks together. Although the spectators were few, the Native dancers were still out there dancing in the rain. In a day and age where rain equals holing up in front of the TV, it’s great to see people who aren’t scared off by a bit of weather. Come Monday morning I didn’t record my sales for taxes or put away quills. Instead, I set to work on some treasure-hunting field bags for the kids. I saw this idea on some one’s blog (if it was you, let me know so I can give you credit!) 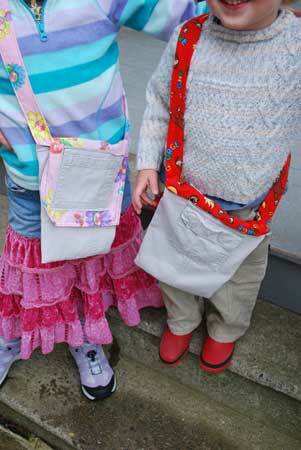 to turn turn old cargo pants into a kid bag with lots of pockets. I cut off the legs, sewed up the bottoms and added new fabric to make the strap and flap. The kids were so excited. A great place to stash all their dandelions and rocks from neighborhood walks. My pockets will be so empty! 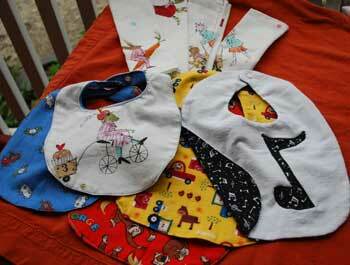 Bibs and napkins will keep everyone clean! The studio is still a mess, maybe even a bigger mess. But the way I look at it, I am cleaning up my studio by using the fabric crowding the space. It’s all in the attitude, right? This entry was posted in Events, Fabric, Kids, Nature, Porcupine Quillwork and tagged Fabric, field bag, Porcupine Quillwork, powwow by Susan. Bookmark the permalink. love the one with the musical note! hee hee. you are the bib mistress. i’ll need to give them back to you so you can repurpose them into something cool……..for a price of course!